Bexhill Open Air Cathedral and Captain Cook Memorial and Lighthouse will appeal to history buffs. Escape the urban bustle at Stand-Up Paddleboarding and Lennox Head Beach. Take a break from Gold Coast with a short trip to Cape Byron Lighthouse in Byron Bay, about 1h 30 min away. Spend the 9th (Sat) exploring nature at Natural Bridge. There's still lots to do: explore the striking landscape of Burleigh Head National Park, stroll through Kurrawa Beach, enjoy the sand and surf at Greenmount Beach, and buy something for everyone on your list at Robina Town Shopping Centre. For more things to do, photos, where to stay, and other tourist information, go to the Gold Coast trip itinerary planner . London, UK to Gold Coast is an approximately 28-hour combination of flight and train. You can also fly; or do a combination of train and flight. Due to the time zone difference, you'll lose 10 hours traveling from London to Gold Coast. Prepare for much warmer weather when traveling from London in February: high temperatures in Gold Coast hover around 32°C and lows are around 24°C. Wrap up your sightseeing on the 13th (Wed) to allow time to travel to Eumundi. Eumundi is a small town and locality in the Sunshine Coast hinterland in the Sunshine Coast Region, Queensland, Australia, 21 km south-west of Noosa Heads and 118 km north of the state capital, Brisbane. Kick off your visit on the 14th (Thu): explore the historical opulence of Sunshine Castle, kick back and relax at Marcoola Beach, and then stroll through Mooloolaba Beach. On the 15th (Fri), you'll have a packed day of sightseeing: see the interesting displays at Queensland Air Museum and then take in the spiritual surroundings of Chenrezig Institute. For ratings, other places to visit, traveler tips, and tourist information, refer to the Eumundi tour planner. Drive from Gold Coast to Eumundi in 2.5 hours. Finish your sightseeing early on the 15th (Fri) so you can travel to Magnetic Island. Discover out-of-the-way places like Big Mama Sailing and Geoffrey Bay. Do some cultural sightseeing at Magnetic Island Forts Walk and Magnetic Island Museum. To see maps, ratings, reviews, and tourist information, use the Magnetic Island online trip builder . Do a combination of bus, train, flight, and ferry from Eumundi to Magnetic Island in 9 hours. Alternatively, you can do a combination of bus, flight, and ferry; or do a combination of car and ferry. In February in Magnetic Island, expect temperatures between 37°C during the day and 28°C at night. Finish up your sightseeing early on the 18th (Mon) so you can travel to Port Douglas. Give yourself a bit of retail therapy at Sunday Market Port Douglas and With Sugar. 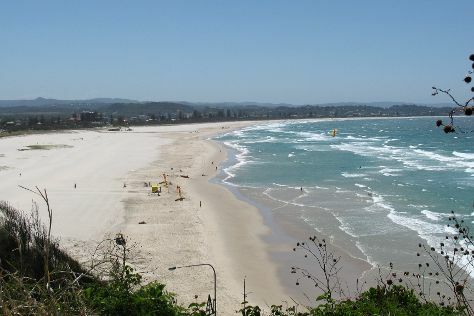 You'll enjoy a bit of beach vacationing at Four Mile Beach and Wonga Beach. When in Port Douglas, make a side trip to see Daintree Discovery Centre in Cow Bay, approximately 1h 20 min away. Spend the 19th (Tue) among aquatic life with a scuba or snorkeling tour. There's much more to do: relax in the rural setting at Hartley's Crocodile Adventures, take in the exciting artwork at Des Spencer Galleries, and do a tasting at Shannonvale Tropical Fruit Winery. To find more things to do, ratings, where to stay, and tourist information, refer to the Port Douglas online travel route planner . You can do a combination of ferry, flight, and shuttle from Magnetic Island to Port Douglas in 5.5 hours. Alternatively, you can do a combination of ferry and car; or do a combination of ferry, bus, and shuttle. In February, daytime highs in Port Douglas are 36°C, while nighttime lows are 28°C. Finish your sightseeing early on the 22nd (Fri) to allow enough time to drive to Cairns. Satisfy your inner culture vulture at The Crystal Caves and St Monica's Cathedral. Escape the urban bustle at Scuba & Snorkeling and Babinda Boulders. Change things up with these side-trips from Cairns: Curtain Fig National Park (in Yungaburra) and Palm Cove Beach (in Palm Cove). Next up on the itinerary: browse the eclectic array of goods at Rusty's Market and look for gifts at Cairns Art Gallery. To find other places to visit, ratings, more things to do, and more tourist information, you can read our Cairns trip planning tool . Drive from Port Douglas to Cairns in 1.5 hours. Alternatively, you can take a bus; or take a shuttle. In February, daily temperatures in Cairns can reach 36°C, while at night they dip to 28°C. You'll have a few hours on the 27th (Wed) to wrap things up before traveling home.